Message to Obama – Reject and Protect. Oceti Sakowin Territory – Just three days before the U.S. Department of State’s public comment period ended on the TransCanada’s Keystone XL Pipeline Project (KXL), Pipeline Fighters and Water Protectors from across South Dakota and Nebraska gathered for a meeting in Winner, SD, hosted by the Ihanktonwan Treaty Council and the Brave Heart Society to discuss direct-action campaign strategies that will include grassroots spiritual camps along the Keystone XL corridor, as well as a National event to be held the third week of April, 2014, with the message to President Obama – “Reject and Protect”. 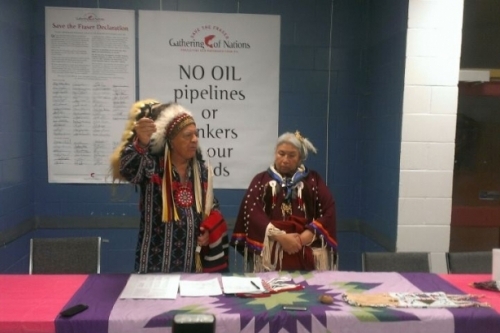 Tribal members of the Oceti Sakowin, along with allies discussed how to heighten awareness of the catastrophic danger that the monstrous KXL Pipeline will not only have on the water, which will be non-reversible damage, but to the entire Midwest, known to most Americans as the Bread Basket of America. The proposed 1,700 mile TransCanada’s Keystone XL will pump the dirtiest, highly toxic oil from the tar sands in Canada, going directly over the north-east portion of the Ogallala Aquifer, which is the largest fresh water aquifer in the United States and provides water to ranches, farms, towns and cities from South Dakota all the way to Texas. This pipeline will stretch from the Canadian border, through the Dakotas and the Sand Hills of Nebraska and all the way to the oil refineries in Texas, owned by the Koch Brothers, who also have shares in TransCanada. Chief Arvol Looking Horse, 19th Keeper of the Sacred White Buffalo Calf Pipe, offered the opening prayers at the meeting and provided encouragement to continue the unification of all people to stop the desecration of Mother Earth. “My heart is heavy, the Water of life – Mini Wiconi is speaking to us through our ceremonies and many people are having dreams. As I hear the Voices standing up against the destruction of Grandmother Earth, I realize we need to stand in Unity to protect the Water of Life,” Looking Horse said. It is the position of the Pipeline Fighters and Water Protectors that the KXL poses a direct threat of major water contamination along this route. There are also twenty-two rivers that are in the direct path of the KXL. “They will go approximately twenty-five feet below the bedrock of these rivers,” said John Harter, one of the local ranchers. In addition, numerous other water sources, such as wells and tributaries will also be affected when the KXL leaks or breaks. The impact to Native species along the route were also discussed and how the building of the KXL will affect the precious ecosystem, already stressed from past years droughts, such as migratory birds like the Sand Crane in Nebraska. “We witnessed the Sand Cranes coming to greet us when we had our first spiritual camp in Ponca, Neb.” Said Aldo Seoane, Oyate Wahacanka Woecun. Jane Kleeb of Bold Nebraska spoke about the Washington DC action that took place in front of the White House on Sunday March 2nd, where 300 individuals were arrested opposing the proposed Keystone XL Pipeline. Kleeb stressed the need to have focused, unified, direct action campaigns opposing the pipeline, showing unity between the landowners and local tribes. “Our ranching and farming families have a tradition of protecting their neighbors. If a fence is down, your neighbors are right there helping you. That is why the Cowboy and Indian Alliance is strong. We are neighbors with shared values of protecting our land and water for future generations. We are proud people and we will stop this pipeline.” Kleeb said. Meeting organizer, Faith Spotted Eagle, Protect the Sacred and the Brave Heart Society, focused discussion on upcoming spiritual camps that each of the tribes agreed to hold on their respective reservations and close as possible to the KXL corridor. “We need to pursue a unified message and approach for all allies, including media strategies, and Indigenized Consultations Standards as an act of sovereignty,” she said. The group discussed dates and locations for where some of the encampments may be held and will coordinate media updates to notify the public when the spiritual camps will be occupied. Treaty elder advisors explained protocol to be in place for organizing the upcoming actions. Protect the Sacred will be offering some resources for spiritual camp organizing for those grassroots communities in the direct path of the KXL. Gary Dorr of Oyate Wahacanka Woecun (Shielding the People) spoke about camp specifics and strategies to ensure that the overall message of solidarity against the pipeline was heard. Oglala Sioux tribal representatives also pledged support for the camps, along with Rosebud Sioux Tribe. The Cheyenne River Sioux Tribal officials were not in attendance; however their official Tribal resolution opposing the Keystone XL Pipeline was presented to organizers. The majority of the Oceti Sakowin stands strong with a message of No KXL in Treaty Territory and will continue to protect their historical treaty lands, sacred sites and sacred species. The 1980 United States Supreme Court ruled that the Treaty is the “Supreme Law of the Land” and the Tribes have been steadfast for the United States to honor the treaties, which can help protect all those living within the treaty boundaries their inherent right to clean drinking water, now and for future generations. The Brave Heart Society and Ihanktonwan Treaty Committee would like to thank the following organizations for attending: Wolakota-World Peace and Prayer Day, Oyate Wahacanka Woecun, Oglala Sioux Tribe, Bold Nebraska, 350.org, Dakota Rural Action-Nebraska Chapter, Cowboy Indian Alliance, White Buffalo Calf Woman Society, Domestic Violence Prevention Initiative of RST, Raoul Wallenberg Institute of Ethics, members of the Oceti Sakowin, concerned land owners, ranchers and citizens. They also would like to thank all those who are committed to standing up for our future generations and look forward to more organizations, tribes and citizens joining in these unified efforts to stop TransCanada’s Keystone XL pipeline and the Tar Sands. Please watch for further updates via social media and/or at the following websites: http://www.boldnebraska.org, http://www.protectthesacred.org or http://www.shieldthepeople.org . This entry was posted in Make No Bones Shows and tagged Chief Phil Lane Jr., Connecting with Spirit, Faith Spotted Eagle, KAOS 89.3 FM, Lakota Nation, Make No Bones About It, Message to Obama – Reject and Protect., No Pipeline, Protect the Sacred, Raven Redbone. Bookmark the permalink.